Have you tried Ramen before? What was the best Japanese ramen you’ve ever had? Let us know in the comments below. Well good morning guys. Good morning. Second full day here in Osaka (大阪). We are still super jet lagged. We woke up at 1 am in the morning. It is now quarter to 5 am. I know it feels like it is later on in the day. It is hilarious that it is only five in the morning. In fact the metro is just opening up now. We are heading out. 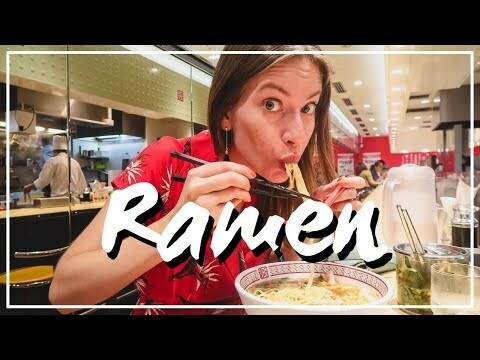 We found a ramen shop that is open 24 hours a day. And we figured this is perfect. We are jet lagged, we need food, let’s go eat some ramen noodles (ラーメン). We have made it to Dōtonbori (道頓堀) and the place we wanted to go to is packed. It is super tiny and it is kind of like a bar style restaurant where you just sit. You sit at the bar and you slurp on your noodles but there is no space so we walked around found another place where we actually have to order from a machine. Yes. Interesting. And that should be fun. That is what we’re going to do. We’re just reading the menu that is outside and then we’ll place our order. I’m getting number 6 the Ramen with soft-boiled seasoned egg and Sam is going for number 11 the meat filled wonton dumplings Ramen (ラーメン). We have our receipts. Sam is going to give us a quick history of Ramen. Yes. Courtesy of wikipedia. Ramen is a Japanese dish it consists of Chinese style wheat noodles served in a meat or occasionally fish based broth. Often flavoured with soy sauce or miso. And uses toppings such as sliced pork, dried seaweed and green onions. Nearly every region in Japan has its own variation of ramen from the tonkatsu pork one to bone broth ramen of Kyushu to the miso ramen of Hokkaido. Alright and so ramen (ラーメン) is the specialty of Japan and we can’t wait to try ours. That was a great meal. The price of the meal um in terms of the ramen was 1740 Yen which is just under 16 US dollars. Basically 8 per person. I thought that was excellent value. Like the sizes were huge. Like this is one of the biggest breakfasts I’ve had in a very very long time. The ingredients were fresh and it was just a cool eating environment. There were a lot of other people in there slurping surprisingly this early in the morning. If you are in Osaka (大阪) or really anywhere in Japan to be honest definitely make sure to have a few bowls of ramen (ラーメン). Ramen. Ciao for now.